The Global Affair Center (GAC) which is a part of the International Education Office organized a lecture series during the month of February. 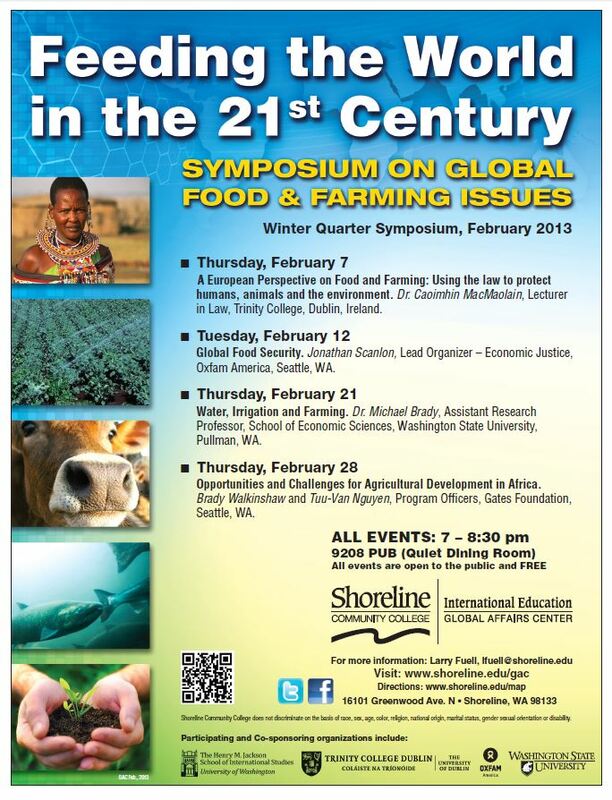 This symposium focused on global food and farming issues. Speakers consisted of people from various organizations and professors from different schools. These events are free and open to the Shoreline community. Many students, staff, faculty and community members attended the events. One of the lectures I attended was on agricultural development in Africa. Two people from the Bill & Melinda Gates Foundation came to our campus to discuss the opportunities and challenges of African agriculture. I am very interested in the topic because my major at Seattle University was International Studies and my minor was Global African Studies. I have learned and done research about farming and food aid in Africa. I thought that the lecture was interesting and informative. The speakers discussed crops, families and farming, food aid, food markets etc. They also presented statistics (graphs, pictures, charts) to help the audience understand the issues. People asked several questions and even stayed afterward to talk to the speakers. These events are often extra credit for students (they will receive extra points for their class). So it is a great way to receive extra credit and learn something valuable!